I used to convert characters from Daz several time and never had any issue. Now I'm finally working on a real project... I now have my genesis 3 characters that have problems with the eye. 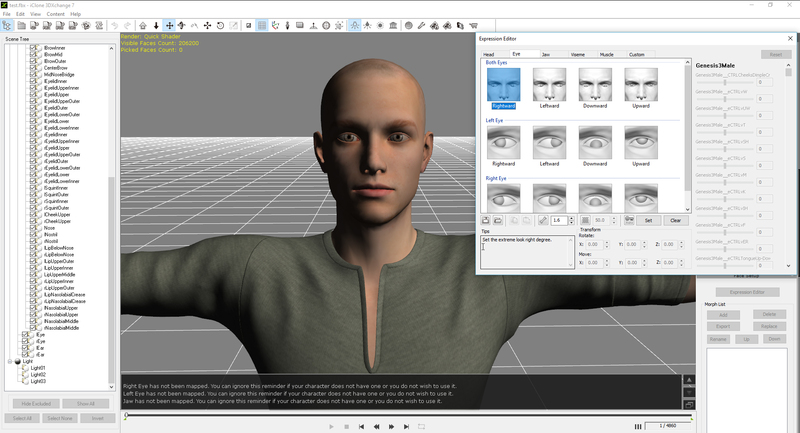 Everything seems right in the process, I'm using the latest Genesis 3 Male Duf Key on my Genesis 3 Male, but when in 3DXchange, all the Head, Jaw, Viseme, Muscle morphs are working, but not the eye. 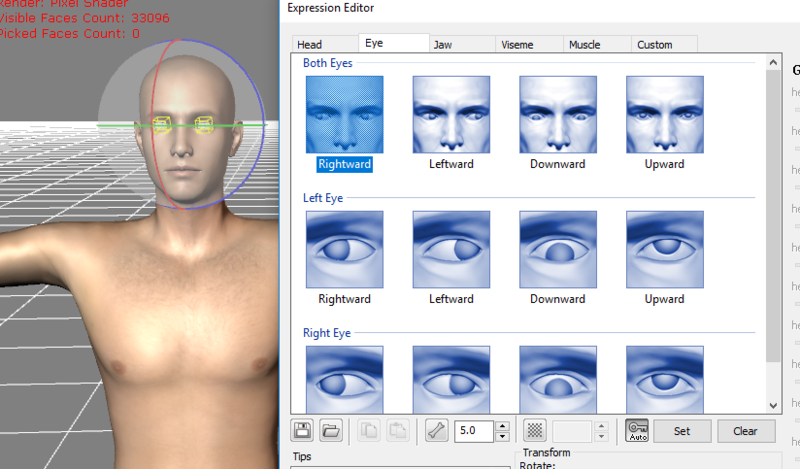 And when going on the Expression Editor, I get a message saying the Right Eye, Left Eye and Jaw have not been mapped. Any idea what I'm missing ? I'm using 4.10.0.123 Pro Edition (64 bits) and 3DXchange 7.2.1220.1 Pipeline edition. I am having the same issue. I submitted a ticket to technical support. Their 1st response was for me to watch the tutorial about importing genesis etc. Of course, I have done that many times. I am waiting to hear back from them after my second report to them about the eye mapping problem. I think some line of code got left out or corrupted in 3dxchange. I will let you know if they fix it. In the meantime, you can manually map the eyes. Glad you found that. From your support message, I though you were only having trouble with the Expression Editor. It seems there may be an issue with actual bone assignment. I'll run some tests with Genesis 8 and 3DX7.2. I just tested a G8 with a freshly downloaded Genesis Extension, and am seeing this issue as well. It would be good to add it as a bug to the Feedback Tracker. I've tried this with the G3 and G8 characters and the only way I can recreate this is to have the "Animations" checkbox unchecked. I've used both "Genesis8_Male_iCloneFaceKey" and the "Genesis3_Male_iCloneFaceKey" and get the same results. Also, as I'm sure you've noticed, the eyes and lower jaw are not automatically set by the .duf file and you must set them manually in 3DXchange as well as manually setting the eyes and jaw settings in the "Expression Editor". 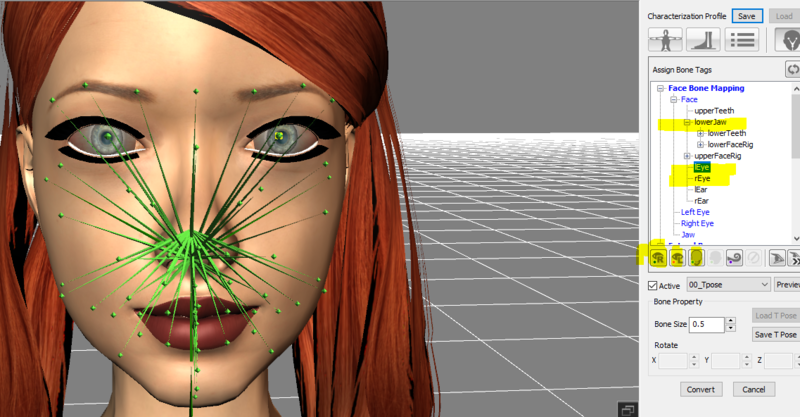 Setting the Jaw and Eyes in the Expression Editor will not work if you don't set them correctly in the "Face Bone Mapping" section first, they'll just be greyed out and not adjustable. Results with "Animation" checkbox unchecked. Results with "Animation" checkbox checked. 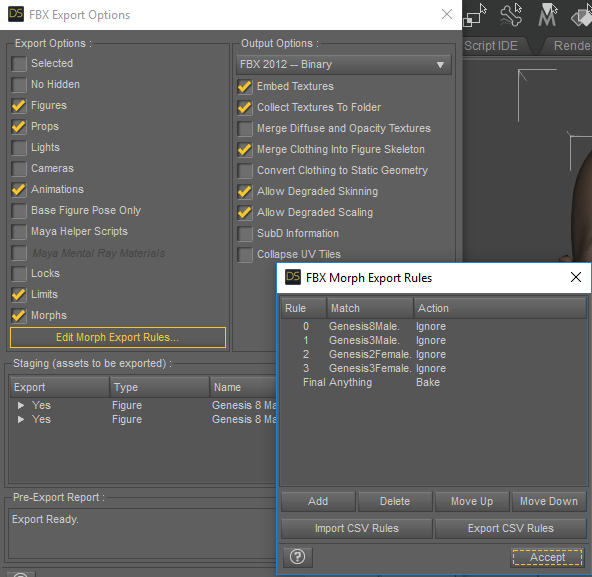 Here is what I use for export settings in DAZ3D 4.10. 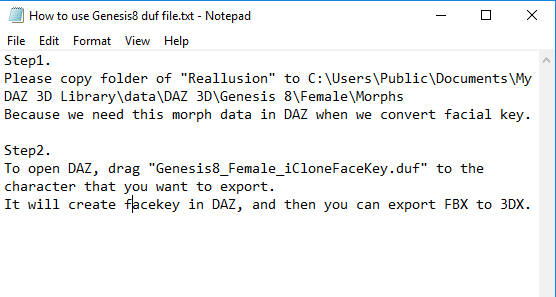 There's also a "Reallusion" folder that came with the iCloneFaceKeys that need to be placed in "My DAZ 3D Library\data" as found in the "How to use Genesis8 duf file.txt" text file in both the Genesis8_Male and Genesis8_Female folders found in the "DAZ Genesis Extension" folder. I don't know if this did anything to help or not but I put them in there! I dug an old video about setting facial bones. Juicy part is at 3:45. Thank you for contacting Reallusion. It is being looked into. The Feedback Tracker entry shows "assigned". Expect a fix in a point update. Sorry, I don't when though. Thanks everyone for detailing your findings here and for initiating contact with RL. I too have now experienced the issue, SO IT'S A BIG DEAL NOW. We can pile Genesis eyes on top of an invisible SpeedTree that glows with Bloom Ring Artifacts, jumps when you use directional puppet more than 2x, and crashes after you mod the bones 5 or 6 times.